I wanted to let you all in on one of my sewing secrets: Color Catchers. 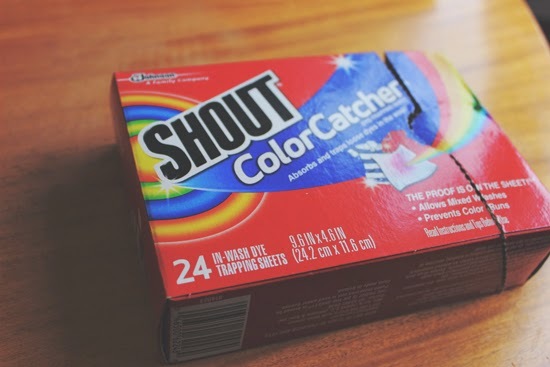 Color Catchers are little sheets of magical paper that you throw into the washer with your laundry. The sheets pick up excess dyes that come off fabrics and absorb the color instead of the colors bleeding into your other clothes. They're especially perfect when it comes to stripes. 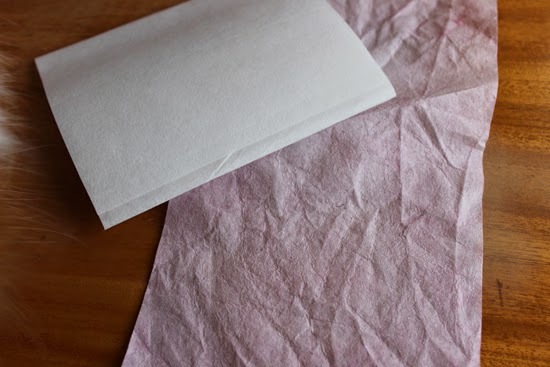 The white sheet above is a fresh and unused Color Catcher and the dingy pink looking thing is one that has been through the wash with some red fabric. Whenever I am pre-washing fabric in the washer with my laundry I always throw one in, better safe than sorry. How many items have you ruined due to colors running? 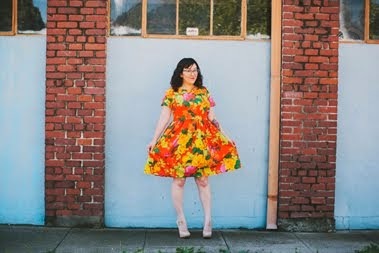 Have you ever used Color Catchers? I think they are the best grocery store find ever! I could really use these on the vintage style jeans I bought recently! They're indigo dyed so after several washes they STILL bleed. I had no idea these magical sheets even existed! You're a genius. I haven't tried the sheets before, but like Rochelle, I have jeans that keep on bleeding after several washes. I throw white vinegar in with all my loads, for several reasons, one of them being that vinegar prevents color bleeding/fading. It's worked for me so far. I'm extra cautious with new reds though--red is the worst!! I use them in almost every load of laundry. My kids wear lots of bright tees and they bleed like crazy. I've seen these, but never bought them. A pair of tan, grey, white floral camo jeans were recently ruined when a pair of jeans that had been washed many times went into the wash together. These may have helped, except someone else did that load fateful load. I still might try them.